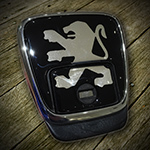 We’ve just added a new Peugeot 406 tailgate/boot lock badge from the Peugeot 406 Coupe and Saloon. These are always subject to a lot of wear and tear, and are usually badly scratched, faded and generally worn out. They’re supplied in two sections just like the originals used to be, and you can pull the old tin ones off and apply these over the clean plastic housing to make them look as good as new. 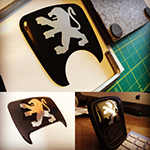 They are produced in a similar method to our 306 and 106 boot badges, being that they’re a premium black and chrome mirror vinyl with a top-coat of premium polyurethane resin to form a gel domed surface that’s hard-wearing and looks the part. Check them out for yourself here! 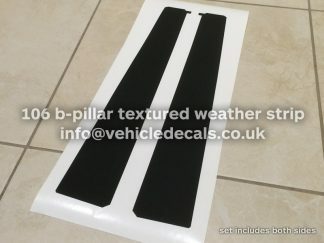 Extra E36 Door Badge styles just added! 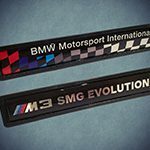 We’ve just added a couple more versions of our Custom E36 Door Badges to the product page, including a new Black Edition BMW Motorsport International Badge and a new “SMG Evolution” style for the SMG-box E36 owners out there. We are always keen to introduce new styles, so if there’s something you’re after in particular, drop us a message and we’ll see if it’s something we can offer! 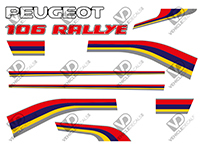 We’ve just released our Peugeot 106 S1 Rallye Decals here (available as sets or individual stickers). We have been working on these for a couple of months now, perfecting colours and ratio/sizes and we’re happy to announce that they’re now available to buy, either as full sets, or as individual decals. 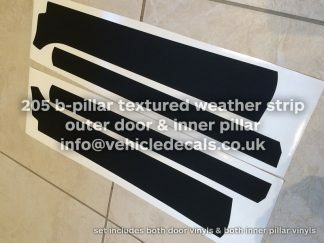 They are fully solvent printed, including the metallic silver, and are produced on a white cast vehicle-grade vinyl with suitable gloss over-laminate to protect against weathering. 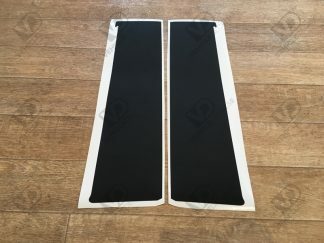 These are our very own Peugeot 106 (S2) and Peugeot 306 (P2/P3) Boot Lock Surround Badges, produced on a premium gloss black and chrome vinyl, with a clear top-coat of polyurethane resin to give it the gel/raised effect. These are well known for being badly scratched, faded, and completely ruined due to weathering. We recommend removing all traces of the old tin badge and glue, and applying these over a nice clean surface of the existing boot lock for a finish that is sure to last.